Littlehampton Fort, is located at the end of Rope Walk, on the west side of the River Arun. A broad walk has been constructed through the natural sand dunes which allows the southern most part of the Fort to be viewed. From there you can also see the Ramparts. The Fort is now 157 years old and currently listed as a Scheduled Monument and building at Risk with Historic England. Over the years, the sand dunes to the south of the Fort have provided a unique and natural protection from the southerly winds and forces of nature. This means that much of the Fort is still in good condition. However, it is under threat. The Fort is currently overwhelmed by vegetation. This vegetation is causing damage to the remaining structures and is putting the whole future of the Fort at risk. Below are a selection of documents containing research produced by Hilary Greenwood, Fort Volunteer Researcher. 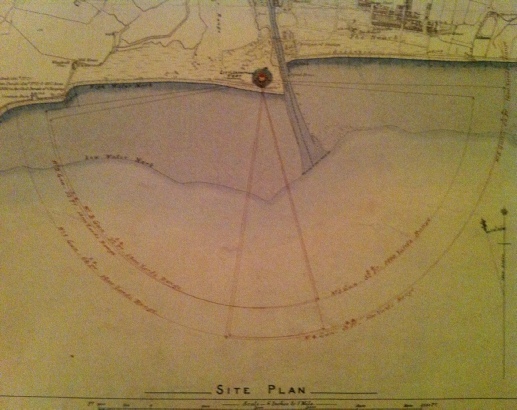 A 19th century artillery fort known as Littlehampton Fort, 317m south west of the Windmill Theatre. This monument is scheduled under the Ancient Monuments and Archaeological Areas Act 1979 as amended as it appears to the Secretary of State to be of national importance. This entry is a copy, the original is held by the Department for Culture, Media and Sport. Littlehampton Fort belongs to the class of military installation termed ‘batteries’ – self contained positions where guns were mounted for purposes of offensive or defensive action; the objective being primarily to bring guns to bear on a specific area, to provide the appropriate range and to protect the guns (and crew) during action. Ammunition would be usually stored behind the rampart (the area known as the ‘gorge’) and by the later 19th century, in purpose built magazines. As a source of information for developments in military technology and as indications of the ebb and flow of international politics, all examples exhibiting a significant degree of preservation are considered worthy of protection. Littlehampton Fort is a good example of a 19th century artillery fort, which survives well. The covering of sand will have aided the preservation of the fort and associated archaeological deposits, providing some protection from weathering and erosion. The fort represents a significant phase of experimental fortification, following 19th century developments in heavy guns with increased range. The monument includes a 19th century artillery fort, known as Littlehampton Fort, surviving as upstanding structures and below-ground archaeological remains covered by shifting sand dunes. It is situated on the west bank of the River Arun at the entrance to Littlehampton Harbour. 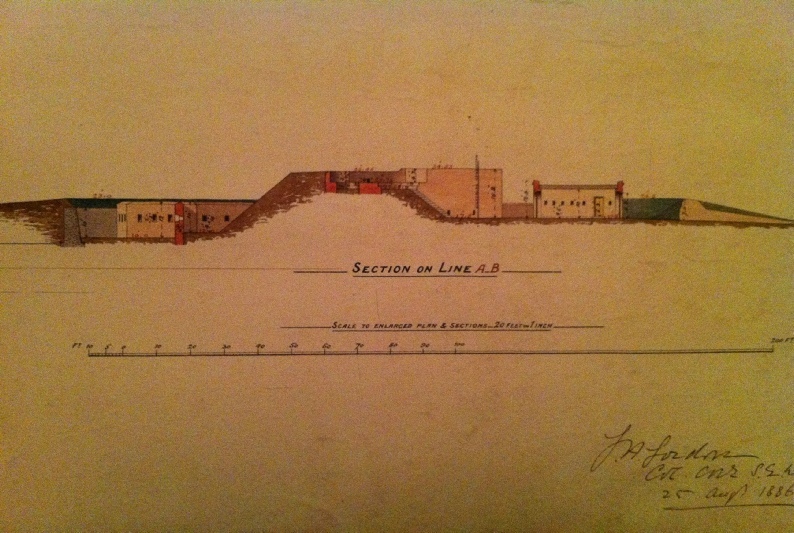 The fort is built of red brick and pebble and includes a lunette battery for three 68 pounder guns and two 32 pounder guns, which is surrounded by a detached Carnot wall with three open bastions defended by musket loops. Although the fort is largely covered by sand the Carnot wall is thought to survive to full height with original coping. The exterior moat is completely filled with sand but survives as a buried feature. The barrack block and offices to the rear of the fort were partially demolished in about 1965 but the foundations are still visible. The Littlehampton Fort is similar in design to Shoreham Fort, but the Carnot wall have open bastions instead of caponiers. Littlehampton Fort was built to replace a gun battery, which had been built in 1764 on the east side of the harbour. This was dismantled in about 1834 and became a coastguard station. The new fort was constructed by a London building firm, Messrs Lock and Wesham, under the supervision of Captain Fenwick of the Royal Engineers between February and September 1854.
he new Fort was planned to accommodate two infantry officers, one master gunner, 42 Non Commissioned Officers and a further 30 Non Commissioned Officers and in a small building outside the fort, on the north side. The five guns were probably installed after the Crimean War (1853-1856). However the fort was taken out of action in 1873. It was almost certainly re-fortified during the Second World War and an observation post was built nearby between 1940 and 1941. Further archaeological remains survive in the vicinity of this monument, such as a Second World War observation post, but are not included because they have not been formally assessed. 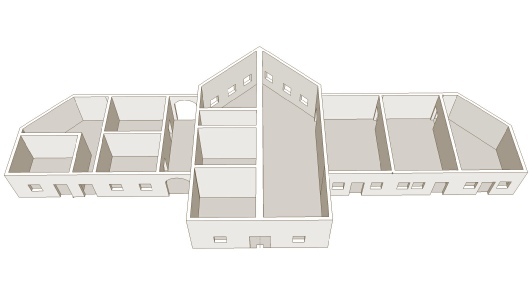 A 3D render of how the fort would have looked. An ariel 3D render of how the fort would have looked. 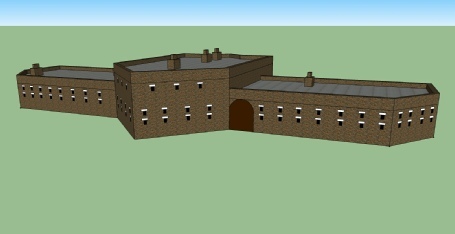 The Fort buildings comprised of accommodation for Officers/Solider’s and a Quarter Master. 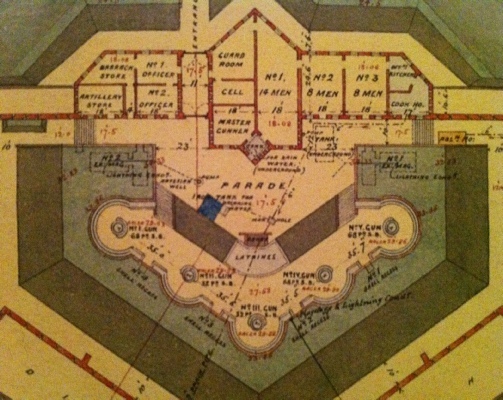 The buildings also included a Cook house, Cell, guard room and a barrack and artillery store. These CAD drawings represent how the block would have looked back in 1854. The height of the building block would have been level with the Ramparts on the Southern/Eastern and Western sides. 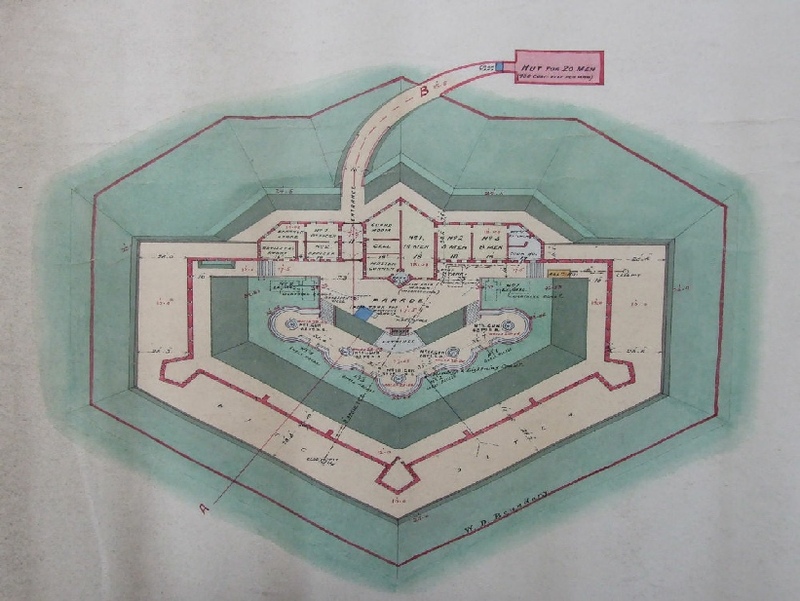 The fort consisted of a platform for the guns with ramparts surrounded by a nine yard (eight metre) wide ditch. The ditch incorporated a 12 ft high Carnot wall running along its centre. This was designed to halt attackers attempting to cross the ditch. The wall itself had loop-holes for defenders to fire through. In addition at each corner were projecting open bastions from which the garrison could fire at besiegers along the length of the wall. To the rear of the gun platform was a fortified barrack block. 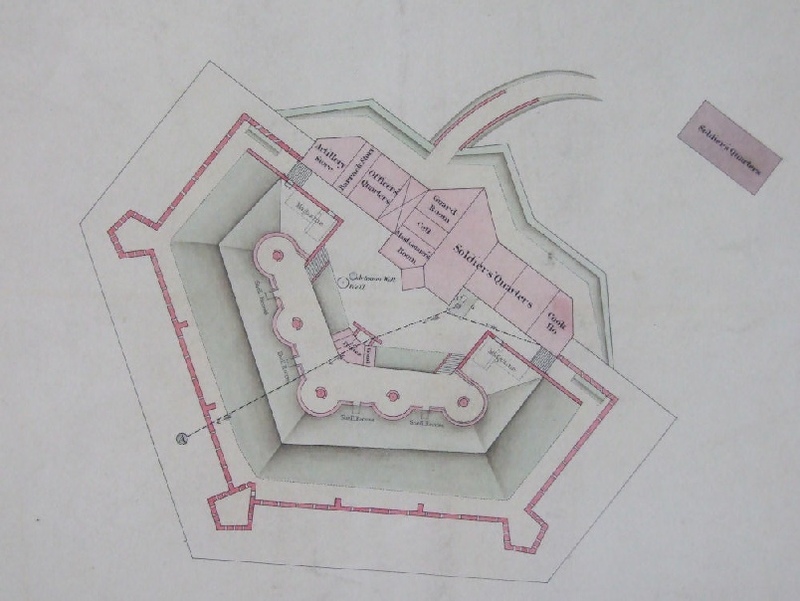 The fort was the first of its kind in the United Kingdom; its Carnot wall and three open bastions making it unique. A bastion, or a bulwark, is a structure projecting outward from the main enclosure of a fortification, situated in both corners of a straight wall (termed curtain), facilitating active defence against assaulting troops. It allows the defenders of the fort to cover adjacent bastions and curtains with defensive fire. The bastion was designed to offer a full range on which to attack oncoming troops. Previous fortifications were of little use within a certain range. The bastion solved this problem. By using a cannon to cover the curtain side of the wall, the forward cannon could concentrate on oncoming targets.